Nucleophilic perfluoroalkylation reactions involve the reaction of a nucleophilic source of a perfluoroalkyl group with an electrophile. Common sources of nucleophilic perfluoroalkyl groups include (trifluoromethyl)trimethylsilane and perfluoroalkyl organometallic reagents. These react with a diverse set of electrophiles including alkyl, alkenyl, and aryl halides and carbonyl compounds. The thermal, chemical, and metabolic stability of perfluoroalkyl groups makes them appealing in a variety of applications, such medical devices, pharmaceuticals, and liquid crystalline materials. Although the trifluoromethyl or perfluoroalkyl unit can be introduced using several distinct fluorination methods, introduction of an intact perfluoroalkyl group through substitution or elimination avoids the often harsh conditions associated with fluorination. Ionic perfluoroalkylations can be divided into nucleophilic and electrophilic reactions; the former have emerged as the most attractive method for introducing the perfluoroalkyl group over the past several decades. The most common conditions used to deliver nucleophilic perfluoroalkyl groups are summarized in Eq. 1. Viable electrophiles for these reactions include organohalides and pseudohalides, carbonyl compounds, and a variety of compounds of the main-group elements. Many nucleophilic perfluoroalkylation reactions involve the generation of perfluoroalkyl carbanions. The stability of these species reflects a balance between negative hyperconjugation, inductive effects, and repulsion between fluorine lone pairs and the anionic carbon. Evidence for negative hyperconjugation was provided by a study of the perfluoro-1,3-dimethylcyclobutanide anion (Eq. 2). The planarity of the anion in an X-ray crystal structure supported the importance of negative hyperconjugation in stabilizing β-fluorocarbanions. The trifluoromethylation of aryl halides is promoted by trifluoromethylcopper generated from fluoroform. Studies of this reaction support a mechanism involving rate-determining oxidative addition of ArX to CF3Cu followed by rapid reductive elimination to form the Ar–CF3 bond. A radical mechanism, typical of perfluoroalkylsilver species, was ruled out in this study. The Ruppert-Prakash reagent, (trifluoromethyl)trimethylsilane, serves as a nucleophilic source of the trifluoromethyl group upon activation with a Lewis base. Coordination of the Lewis base to silicon generates a five-coordinate species that delivers the equivalent of the trifluoromethyl anion to electrophiles (Eq. 3). A substoichiometric amount of Lewis base is required for activation, as the anionic products of addition or substitution can coordinate to the silicon center. Activated TMSCF3 behaves as a hard nucleophile and typically undergoes 1,2- rather than 1,4-addition to α,β-unsaturated carbonyl compounds. Although Morita–Baylis–Hillman adducts react inefficiently with TMSCF3 and fluoride, in the presence of a nucleophilic amine catalyst, this allylic substitution reaction proceeds smoothly. Use of a bis-cinchona alkaloid catalyst renders the reaction enantioselective (Eq. 4). Cinchona alkaloid derived catalyst 1 promotes the trifluoromethylation of aryl aldehydes with moderate enantioselectivity (Eq. 5). A substoichiometric amount of tetramethylammonium fluoride (TMAF) is used as activator in this reaction. Hydrogen bonding between the hydroxyl group of the catalyst and the carbonyl oxygen as well as electrostatic interactions between the cationic nitrogen of the catalyst and the anionic nucleophile are believed to contribute to enantioselectivity. Enantioenriched sulfoxides can serve as chiral auxiliaries in additions to sulfinylimines. Diastereoselective trifluoromethylation with TMSCF3 and tetrabutylammonium difluorotriphenylsilicate (TBAT) is followed by hydrolysis of the intermediate sulfinamide, affording chiral α-trifluoromethylamines in good overall enantioselectivity (Eq. 6). The broad scope of nucleophilic perfluoroalkylation is in part due to the variety of available reagents that act as sources of nucleophilic perfluoroalkyl groups. Fluoroform is perhaps the most attractive source of the trifluoromethyl anion due to its availability. The trifluoromethyl anion may be generated electrochemically from fluoroform in the presence of 2-pyrrolidinone. Chemical reduction of trifluoromethyl halides is a second method used to generate the trifluoromethyl anion. Tetrakis(dimethylamino)ethylene (TDAE) is commonly used as a reducing agent in this context (Eq. 7). Treatment of hot TDAE and trifluoromethyl iodide with acid affords a bis(trifluoromethyl) aminal product. Addition of fluoride to electron-poor perfluorinated alkenes provides perfluoroalkyl anions that react with simple electrophiles such as Cl2, Br2, NOF, NOCl, or BnBr (Eq. 8). TMSCF3 is a versatile trifluoromethylating reagent that can be prepared in a number of ways. For example, this reagent may be generated electrochemically from trimethylsilyl chloride in the presence of trifluoromethyl bromide (Eq. 9). Deprotonation of fluoroform with potassium bis(trimethylsilyl)amide followed by treatment with trimethylsilyl chloride furnishes TMSCF3 in good yield from readily available starting materials (Eq. 10). Organometallic compounds bearing perfluoroalkyl groups represent a broad class of nucleophilic perfluoroalkylating reagents. Compounds of lithium, magnesium (Grignard reagents), zinc, copper, silver, and other metals have been used in perfluoroalkylations of a wide array of electrophiles. CF3Li and CF3MgBr are significantly less stable than perfluoroethyl species, and thus TMSCF3 is more commonly used for delivery of the trifluoromethyl group. Organozincs are less reactive and more stable than comparable organolithium or -magnesium reagents and can be prepared from zinc metal and perfluoroalkyl halides. Perfluoroalkylcopper compounds can be prepared similarly from perfluoroalkyl halides and excess copper metal, although several other methods for their preparation have been reported, such as treatment of (perfluoroalkyl)trimethylsilanes with fluoride and copper(I) iodide in DMF (Eq. 11). 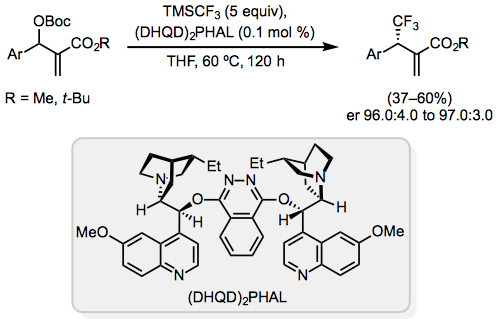 Unactivated alkenes and more electron-poor arylidenemalonates do not react with TMSCF3; however, Meldrum's acid derivatives and arylidenemalonitriles do undergo trifluoromethylation in the presence of this reagent (Eq. 12). Perfluoroalkylcopper reagents are commonly employed in reactions of alkyl halides and pseudohalides, but TMSCF3 may also be used with certain classes of electrophiles. For example, primary alkyl triflates undergo trifluoromethylation in the presence of TMSCF3 and TMAF as activator. Allylic electrophiles react with copper(I) salts and fluoride-activated TMSCF3 to afford predominately the linear (E)-isomer. The geometry of the reactant alkene and the position of the leaving group do not affect the product distribution, suggesting the involvement of a π-allyl-copper(III) complex (Eq. 13). Alkenyl halides (primarily iodides and bromides) are excellent substrates for nucleophilic perfluoroalkylation reactions with perfluoroalkylcopper reagents. Retention of configuration is typically observed (Eq. 14). Aryl and heteroaryl fluorides react efficiently with perfluoroalkyl anions in nucleophilic aromatic substitution reactions. However, other aryl and heteroaryl halides usually require the inclusion of a metallic promoter or catalyst. For instance, 2-iodonaphthalene undergoes trifluoromethylation in the presence of TMSCF3, fluoride, and excess copper(I) iodide (Eq. 15). Aldehydes and ketones are the most common substrates for nucleophilic perfluoroalkylation, constituting over half of all reported examples. Because aldehydes are more reactive than ketones, they are commonly combined with less reactive sources of nucleophilic perfluoroalkyl groups such as perfluoroalkylzincs. 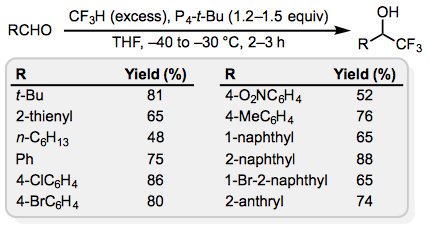 Even so, a wide variety of reagents promote the perfluoroalkylation of aldehydes, some of which are incompatible with enolizable substrates. Trifluoromethyl anion generated from the superbase P4-t-Bu and fluoroform undergoes nucleophilic addition to both enolizable and non-enolizable aldehydes (Eq. 16). Ketones are somewhat less reactive than aldehydes but nonetheless react efficiently under a variety of reaction conditions. (Perfluoroalkyl)trialkylsilanes together with a Lewis basic initiator such as TBAF, CsF, or K2CO3 afford products of perfluoroalkylation of both enolizable and non-enolizable ketones. α,β-Unsaturated ketones typically undergo 1,2-addition in the presence of TMSCF3 (Eq. 17). N-Alkyl aldimines or ketimines are usually unreactive in nucleophilic perfluoroalkyl additions because they are much less electrophilic than aldehydes and ketones. Imines bearing N-perfluoroalkyl, N-sulfinyl, or N-sulfonyl substituents are electrophilic enough to undergo trifluoromethylation with TMSCF3. Iminium salts generated by the treatment of imines with methyl triflate react smoothly with TMSCF3 activated with sodium acetate or potassium fluoride (Eq. 18). The scope of heteroatom electrophiles amenable to perfluoroalkylation is exceptionally broad and includes compounds of boron, silicon, germanium, tin, lead, nitrogen, and other elements. A small number of selected examples are presented here. Halophosphines react with either TMSCF3 or trifluoromethylmetal reagents to afford trifluoromethylphosphines. For example, TMSCF3 with cesium fluoride as initiator promotes the trifluoromethylation of dinucleosides at phosphorus (Eq. 19). Although sulfenyl chlorides undergo trifluoromethylation with TMSCF3 in the presence of TASF in moderate to good yields, a more efficient procedure employs thiocyanates (Eq. 20). Transition-metal complexes containing halogen or alkoxy ligands can be trifluoromethylated using TMSCF3, but these reactions are often more complex than simple nucleophilic processes. Treatment of chloropalladium(II) complexes 2 with (trifluoromethyl)triethylsilane and cesium fluoride affords trifluoromethyl complex 3, which undergoes reductive elimination at elevated temperatures to afford substituted trifluoromethylated aromatic compounds (Eq. 21). When attached to highly electron-deficient atoms or electron-withdrawing groups, the trifluoromethyl and perfluoroalkyl groups can act as electrophiles. Reagents used for this transformation include trifluoromethyl chalcogen salts and perfluoroalkyl halides, and the scope of the nucleophile includes carbanions, alkenes, alkynes, silyl enol ethers, allyl silanes, enamines, and various heteroatomic nucleophiles. Radical perfluoroalkylation reactions involve the intermediacy of an electron-deficient perfluoroalkyl radical. Although perfluoroalkyl radicals are generally less stable than comparable alkyl radicals, steric hindrance lends branched perfluoroalkyl radicals considerable stability. Most reactions of perfluoroalkylsilver reagents are likely to proceed by radical pathways. For example, substituted arenes react with trifluoromethylsilver via a radical pathway to afford a mixture of constitutional isomers (Eq. 22). The scope of transition-metal-catalyzed perfluoroalkylation reactions is growing rapidly, although these cannot be classified generally as nucleophilic perfluoroalkylations. Cross-coupling of TESCF3 and aryl chlorides is promoted by Pd(dba)2 in the presence of BrettPhos or RuPhos ligand at elevated temperatures (Eq. 23). In the absence of these ligands, reductive elimination to form the aryl–CF3 bond is considerably slower due to the strength of the Pd–CF3 bond. The most widely used reagents for nucleophilic perfluoroalkyl additions are (trifluoromethyl)trimethylsilane, perfluoroalkyllithium, perfluoroalkylmagnesium, and perfluoroalkylcopper reagents. Typically, a slight excess of TMSCF3 is used along with a substoichiometric amount of Lewis basic initiator, although less reactive substrates may required a full equivalent of initator. Perfluoroalkyllithium species are generated by lithium-halogen exchange at low temperatures followed by immediate capture with an electrophile; perfluoroalkyl Grignard reagents are prepared similarly using magnesium-halogen exchange. Perfluoroalkylcopper reagents stabilized by 1,10-phenanthroline can be prepared in a straightforward manner from TMSRF, or fluoroform can be combined with CuCl and t-BuOK in DMF or NMP to afford stabilized CF3Cu. To a solution of 1-benzyl-4-trifluoromethanesulfinylpiperazine (292 mg, 1 mmol) and 6-methoxynaphthalene-2-carbaldehyde (186 mg, 1 mmol) in THF (1 mL), cooled to 0 °C, was added dropwise a solution of t-BuOK (112 mg, 1 mmol) in THF (1 mL). The temperature was allowed to rise to rt over 1 h. The crude mixture was hydrolyzed with aqueous HCl (1 M, 1 mL) overnight and was then extracted with Et2O. The organic phase was dried (Na2SO4) and the solvent was evaporated under vacuum. The crude product was purified by chromatography (silica gel) to afford 2,2,2-trifluoro-1-(6-methoxynaphthalen-2-yl)ethanol (233 mg, 91%): 1H NMR (CDCl3) δ 3.23 (s, 1H), 3.93 (s, 3H), 5.16 (q, J = 6.7 Hz, 1H), 7.18 (m, 2H), 7.53 (d, J = 8.5 Hz, 1H), 7.75 (t, J = 8.2 Hz, 2H), 7.84 (s, 1H); 13C NMR (CDCl3) d 55.8, 73.4 (q, J = 32.0 Hz), 106.1, 119.8, 124.9 (q, J = 282.0 Hz), 124.3, 127.6, 127.7, 128.8, 129.6 (q, J = 1.2 Hz), 130.2, 135.4, 158.7; 19F NMR (CDCl3) δ –78.2 (d, J = 6.7 Hz). ↑ Farnham, W. B.; Dixon, D. A.; Calabrese, J. C. J. Am. Chem. Soc. 1988, 110, 2607. ↑ Konovalov, A. I.; Lishchynskyi, A.; Grushin, V. V. J. Am. Chem. Soc. 2014, 136, 13410. ↑ a b Liu, X.; Xu, C.; Wang, M.; Liu, Q. Chem. Rev. 2015, 115, 683. ↑ Furukawa, T.; Nishimine, T.; Tokunaga, E.; Hasegawa, K. Org. Lett. 2011, 13, 3972. ↑ Kawai, H.; Mizuta, S.; Tokunaga, E.; Shibata, N. J. Fluorine Chem. 2013, 152, 46. ↑ Ma, J.-A. ; Cahard, D. Chem. Rev. 2008, 108, PR1. ↑ Shono, T.; Ishifune, M.; Okada, T.; Kashimura, S. J. Org. Chem. 1991, 56, 2. ↑ Pawelke, G. J. Fluorine Chem. 1989, 42, 429. ↑ Bayliff, A. E.; Chambers, R. D. J. Chem. Soc., Perkin Trans 1 1988, 201. ↑ Prakash, G. K. S.; Deffieux, D.; Yudin, A. K.; Olah, G. A. Synlett 1994, 1057. ↑ Prakash, G. K. S.; Jog, P. V.; Batamack, P. T. D.; Olah, G. A. Science 2012, 338, 1324. ↑ Haszeldine, R. N.; Waldschewski, E. G. J. Chem. Soc. 1953, 3607. ↑ Urata, H.; Fuchikami, T. Tetrahedron Lett. 1991, 32, 91. ↑ Dilman, A. D.; Levin, V. V.; Belyakov, P. A.; Struchkova, M. I.; Tartakovsky, V. A. Tetrahedron Lett. 2008, 49, 4352. ↑ Sevenard, D. V.; Kirsch, P.; Röschenthaler, G.-V.; Movchun, V. N.; Kolomeitsev, A. A. Synlett 2001, 379. ↑ Jiang, X.; Qing, F.-L. Beilstein J. Org. Chem. 2013, 9, 2862. ↑ Paratian, J. M.; Labbe, E.; Sibille, S.; Nedelec, J. Y.; Perichon, J. Denki Kagaku 1994, 62, 1129. ↑ German, L. S.; Mysov, E. I.; Ter-Gabriélyan, E. G. Bull. Acad. Sci. USSR, Div. Chem. Sci. 1990, 39, 429. ↑ Zhang, Y.; Fujiu, M.; Serizawa, H.; Mikami, K. J. Fluorine Chem. 2013, 156, 367. ↑ Singh, R. P.; Kirchmeier, R. L.; Shreeve, J. M. Org. Lett. 1999, 1, 1047. ↑ Dilman, A. D.; Levin, V. V. Eur. J. Org. Chem. 2011, 831. ↑ Levin, V. V.; Kozlov, M. A.; Song, Y.-H.; Dilman, A. D.; Belyakov, P. A.; Struchkova, M. I.; Tartakovsky, V. A. Tetrahedron Lett. 2008, 49, 3108. ↑ Tworowska, I.; Dabkowski, W.; Michalski, J. Angew. Chem., Int. Ed. 2001, 40, 2898. ↑ Billard, T.; Large, S.; Langlois, B. R. Tetrahedron Lett. 1997, 38, 65. ↑ a b Jin Cho, E.; Senecal, T. D.; Kinzel, T.; Zhang, Y.; Watson, D. A.; Buchwald, S. L. Science, 2010, 328, 1679. ↑ Kirsch, P. Modern Fluoroorganic Chemistry, 2nd ed. ; Wiley-VCH: Weinheim, 2013. ↑ Ye, Y.; Lee, S. H.; Sanford, M. S. Org. Lett. 2011, 13, 5464. ↑ Morimoto, H.; Tsubogo, T.; Litvinas, N. D.; Hartwig, J. F. Angew. Chem., Int. Ed. 2011, 50, 3793. ↑ Inschauspe, D.; Sortais, J.-B. ; Billard, T.; Langlois, B. R. Synlett 2003, 233. This page was last modified on 26 February 2017, at 00:20.